A proliferant state will succeed in obtaining sensitive items for its nuclear weapons program only if foreign individuals and companies cooperate with agents of that state. Some individuals are willing to break the law to assist; others provide assistance only inadvertently. However, a proliferant is unlikely to be successful in obtaining nuclear weapons without the assistance of many foreigners who are willing to turn a blind eye to questions about the actual purpose of a sensitive item. Proliferant states use many strategies to recruit foreigners. Appeals to patriotism sometimes work to obtain assistance from expatriates. Financial rewards have tended to work best, particularly if punishments are seen as minimal or unlikely. Many individuals, either acting alone or as managers of companies, have sought business with proliferant states to bolster profits. In some cases, their companies were suffering financially, and the managers welcomed lucrative contracts with proliferant states. Once involved, these individuals were unlikely to risk their profits by questioning the end-uses stated by their customers. Many experts and companies have been more willing to participate in questionable exports if they believe that their products are not directly contributing to a nuclear weapons program, or at least that such use can be plausibly denied. For this reason, the creation of credible cover stories by proliferant states is a critical aspect of illicit procurement efforts. Secrecy plays an important role in creating a favorable environment for illicit procurement. Both suppliers and proliferant states have gone to extraordinary lengths to hide their business deals, minimizing the chances of increased scrutiny or a reduction of illicit business. Suppliers have said that they worried about their personal safety if business transactions became known to certain states. For example, Israel is widely believed to have killed or threatened individuals who were supplying Arab countries with items useful to build nuclear weapons. German suppliers to Iraq's nuclear program in the 1980s worried about retaliation for their actions. They also said that they were frightened to reveal their activities in the 1990s because of fear of retaliation by Iraq. Proliferants have tended to shy away from ideologues who want to help with their quest to get nuclear weapons. Although sometimes their assistance is valuable, ideologues may often pose unacceptable security risks. Iraq's gas centrifuge experts have said that their method to obtain assistance from foreign individuals and companies was based on patience and persistence. According to an Iraqi centrifuge expert interviewed in 1993, when seeking the assistance of a person, the strategy was to "feel your way, test his credibility and knowledge, and build up confidence." Before committing to a larger project, he added, "ask him to make a few samples, and then a few more." To pursue this strategy, he said, "you must know a lot yourself." In summary, he stressed that one has to "take guarded steps and never enter into an immediate contract." One Iraqi tactic was to involve the targeted supplier first in legal but lucrative trade. Once confidence is established, the supplier may be more willing to help with illicit or questionable exports. At the very least, the supplier will be more likely to reveal how far he or she is willing to go in supplying items without revealing the true intentions of the end-user. If a financial dependency can be created, the supplier may find it difficult to say no to a questionable export. Many countries engaged in illicit procurement have used off-shore companies to purchase equipment, materials, and technology under a civil cover, and then had these companies ship the items to their country, sometimes via a circuitous route. Off-shore companies may be a post office box, a trading company, or a major institution involved in producing many legitimate items in their own right. The intent of this practice is to make it difficult for export control authorities or intelligence agencies to track procurement patterns that would indicate nuclear weapons research and development activities, or the presence of fissile material production programs that are not consistent with the proliferant state's declared programs. Senior Pakistani nuclear officials have admited using off-shore companies to purchase equipment, materials, or technology under a civil cover, and then ship these items to Pakistan. In a June 22, 1999 interview in the Egyptian newspaper Al-Ahram, A. Q. Khan, the father of Pakistan's gas centrifuge program, said that his program depended mainly on purchasing items for its unsafeguarded gas centrifuge program through a number of off-shore front companies, including companies in Japan and Singapore. He added that these other companies "purchased the equipment and supplied it to us for additional commissions ranging between 15 and 25 percent of the original price." During the 1980s, one of Iraq's most important and trusted procurement agents was the businessman Anees Mansour Wadi, an Iraqi expatriate. Wadi established front companies all over Europe, which could be listed as end-users for a broad range of technology and items. In Britain, he teamed with the British businessman Roy Ricks, to form Meed International, Ltd. Later, they changed the name to Technology Engineering Group (TEG). Wadi made significant contributions to Iraq's military programs. At the end of 1987, for example, Wadi was visited by Iraqis in the nuclear weapons program. According to Iraq's declaration to the IAEA Action Team, this technical team went to the United Kingdom to procure items for the gaseous diffusion and the Beams-type centrifuge uranium enrichment programs. TEG bought a total of 75 items for these programs at a cost of about 1.25 million British pounds, and shipped the items to the Nassr General Establishment. A more sophisticated procurement strategy involves a proliferant state buying overseas companies secretly and using them to provide sensitive items they make on-site or secure elsewhere. This type of arrangement can be very difficult to detect without inside knowledge and can lead to significant violations of national export control laws. During the 1980s, Iraq set up a procurement network in Europe, Japan, and the United States that could procure a wide range of arms and defense equipment through a variety of companies it controlled. The ostensible purpose of the purchases by individual companies in this network was for rebuilding and expanding Iraq's civilian industrial base after the devastation wrought by the Iraq-Iran war. The true purpose of the network was to bolster Iraq's own defense industrial complex. According to a 1987 British intelligence agency assessment, "Iraq intends to use the machinery purchased to manufacture its own munitions," having previously "been paying inflated prices for finished products from the Soviet Union. "2 This network would more importantly grow to play a key, but far less visible, role in supplying Iraq's missile and nuclear weapons programs. In the process, Iraq acquired complete or partial ownership of a number of high technology companies in Europe that would play significant roles in supplying Iraq's nuclear and ballistic missile program. Throughout this effort, these companies would maintain that the items they exported to Iraq were for non-military uses. The origins of this effort are hard to determine from available information, but the process of acquiring these companies was in full swing by 1987. Iraqi agents did not set out to acquire existing high-technology European companies. But a combination of unexpected opportunities and a need to increase its procurement activities led Iraq to acquire several companies. Iraq's purchase of European companies appears to have started with with the establishment of Meed International, which was a procurement front company for Iraq's military industries. Wadi and Roy Ricks, the heads of Meed, were essentially running a procurement outfit to fill orders originating in Baghdad. These two also headed Technology Engineering Group Ltd. (TEG). Meed worked closely with Nassr General Establishment and other Iraqi state-owned establishments. Nassr was headed by Safa al Habobi, who also came to oversee many of Iraq's procurement efforts in Europe and the United States. These establishments carefully cultivated an image that they were seeking only civilian items, although in fact many of their purchases were for military uses. In their search for business, many European companies and governments were willing to turn a blind eye to the actual purpose of these exports, many of which were "dual-use" items. Al Arabi. The Al Arabi Trading Company is reported to have been the secret owner of Meed International. It would become a critical player in Iraq's procurement of companies. Al Arabi Trading Company, also known as Al Arabian Trading Company, was a commercial Iraqi company incorporated in 1984. Farouk Taha (aka Farouk Mustafa) was managing director of Al Arabi. Headquartered in Baghdad, Al Arabi was, in reality, established as a front company to facilitate illicit Iraqi government purchases. The Iraqi organization behind Al Arabi is unclear, but it involved organizations run by Habobi and Hussein Kamel, Saddam Hussein's son-in-law and head of Iraqi military industrialization projects. With Iraq's formation in 1988 of the Ministry of Industry and Military Industrialization (MIMI), headed by Kamel, Al Arabi was widely reported to be controlled by MIMI. Al Arabi served several important procurement roles. It became the secret owner or partial owner of several companies in Europe and the United States. As a commercial company, it did not look like a government-controlled company. If asked by a company, Farouk would deny any connection to the Iraqi government. Despite Al Arabi looking like a civilian company, its role in purchasing European companies was kept extremely secret, and hidden behind elaborate ruses or "trust" agreements. In the latter case, a European would secretly agree to act on behalf of Al Arabi and keep his trust relationship secret. Al Arabi would sometimes act as a sales representative of ostensibly civilian Iraqi companies, which in fact were part of Iraq's military industry. For its services, Al Arabi would collect a "finder's fee" from overseas companies, some of which it in fact it owned directly or indirectly. It might also funnel payments to overseas suppliers. Other times, it performed services under contract for the overseas companies building facilities in Iraq. Part of the justification for these activities appears to have been to shield profits of Iraqi-controlled companies in the United States and Europe. An Iraqi owned company could send a major part of its own sales commission to Al Arabi, reducing its profits and thus taxes. Click here for examples of Al Arabi's activities. In the late 1980s, Farouk also seems to have created a new company, the Al Bashair Trading Co., Ltd. 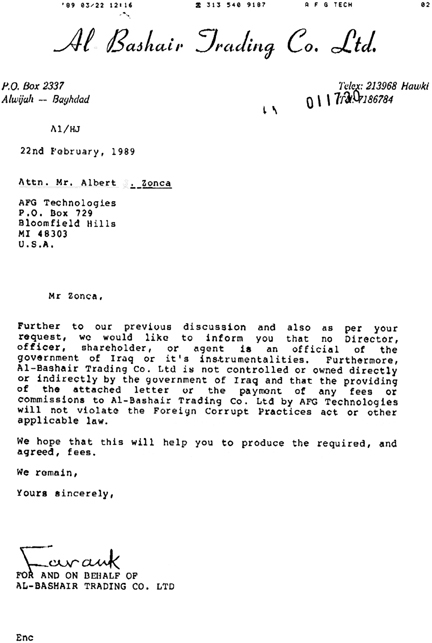 In a letter to a U.S. company, he denies that his company has any connection to the Iraqi government. By the time of this letter, suspicions about Al Arabi's real owners were circulating among Western intelligence agencies. H+H Metalform. By early spring 1987, Iraq's network of agents was actively seeking a large and varied amount of equipment throughout Europe to make sophisticated armaments factories under a nominal civilian cover story. As Meed International arranged for the purchase of a set of items for Nassr General Establishment in the spring of 1987, it contacted the German firm H+H Metalform. As a way to overcome financial problems discouraging H+H Metalform from accepting a large contract, Habobi arranged for the Al Arabi Trading Company to buy secretly 50 percent of H+H Metalform in July 1987. Its partial ownership of H+H was hidden until the early 1990s, when it was inadvertently discovered by German prosecutors. H+H would play a key role in supplying Iraq's ballistic missile and nuclear weapons programs. Click here for information on H+H Metalform. TDG. In October 1987, Wadi is reported to have arranged for the Iraqi government to buy a British firm which was renamed the Technology and Development Group, Ltd. (TDG). Wadi hid the role of the Iraqi government by arranging for Al Arabi to purchase the British company. The board of TDG included several prominent Iraqis, including Habobi, Fadel Jawad Khadhum, Nassir al-Nainsi, and Hana Jon. Khadhum is reported to have also been an employee of the Iraqi government. TDG, under Habobi's leadership, bought companies to expand its procurement capabilities. In essence, Iraq gained an inside track to the purchase of the products of these companies and created procurement divisions within those companies that sought items that Iraq wanted. Within a few weeks of its founding, TDG established the British company TMG Engineering Ltd, which wholly acquired TI Machine Tools of Coventry, Britain (soon afterwards renamed Matrix Churchill Ltd). Matrix Churchill was a leading British tool-maker, which in turn controlled several divisions and subsidiaries. Habobi became the chairman of TMG Engineering and Matrix Churchill Ltd.
TMG also purchased Matrix Churchill Corporation (MCC) of Ohio, USA and Newcast Foundries Ltd. in Britain. MCC had been the service and selling arm of TI Machine Tool in North America. Newcast Foundries was a foundry that produced castings, about 30 percent of which was for Matrix Churchill Ltd. Habobi was also chairman of MCC. 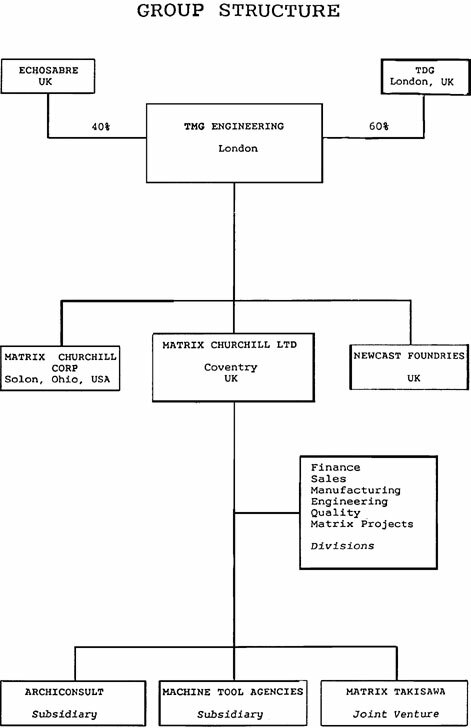 A Matrix Churchill chart written in 1989 shows the relationship between these various companies. TDG grew quickly to become a hub of Iraqi overseas procurement efforts. The companies it controlled played a critical role in this effort. From 1987 until August 1990, TDG was able to arrange the purchase of hundreds of millions of dollars in equipment and factories for Iraq's military infrastructure. TDG arranged for the purchase of a much larger number of items. Iraq's goal was to create an indigenous advanced industrialized base. From this base, Iraqi military officials planned to build sophisticated weaponry. Simultaneously, Iraq could diversify its industries. TDG played the role of a trading company. Typically, it would receive requests from Iraqi state establishments and seek a foreign company to provide a price for the item. 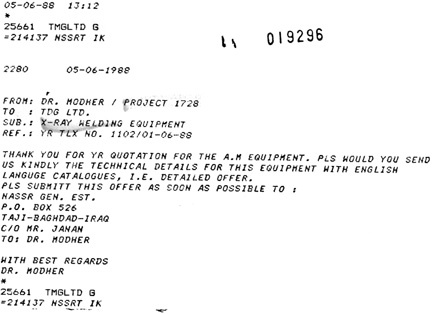 A 1988 telex sent to TDG by Dr. Modher of Project 1728 thanks TDG for its quotation for a x-ray welding equipment and asks for more information. Project 1728 was a secret Iraqi project to develop liquid-propellant rocket engines aimed at building an intercontinental ballistic missile. Once TDG obtained a quotation, it facilitated the sale to Iraq for a commission, usually 5 percent of the total cost of the order. For its fee, TDG helped conduct the negotiations between the companies and the Iraqi establishment. It arranged visits by Iraqi project personnel to the companies and company officials to Iraqi factories and headquarters during the negotiations. TDG sometimes arranged the visits of company officials to Iraq to install equipment and train Iraqi personnel in the use of equipment both in Iraq and at the supplier's facilities. TDG checked on orders to ensure that the items were sent. TDG personnel often had to remind Iraqi establishments to pay for their purchases and attend to problems with letters of credit from overseas banks. If a letter of credit was rejected, TDG in some cases had to arrange for the Iraqi establishment to pay the company directly. Iraq was deeply in debt as a result of the Iraq/Iran War, and obtaining adequate financing to purchase all this equipment was difficult. In that effort, TDG benefited from the special relationship between Iraq and the Atlanta branch of the Banca Nazionale del Lavorro (BNL), a state-owned Italian bank. Many of the purchases of TDG's procurement network utilized low-interest credits from BNL. These loans to Iraq were unauthorized by BNL headquarters in Rome and violated U.S. banking laws. In total, BNL Atlanta gave Iraq $2.16 billion in unauthorized credits. Once it was revealed that TDG and SRC were the shareholders of Canira, the British government moved to stop any financial assistance. A British government official said that "we have reason to believe that Canira's primary objective is to use the plant to gain experience in composite manufacture for the Iraqi missile program. Composites can also be used in the manufacture of ballistic missiles. In particular, they are a key component in the manufacture of heat shields for warhead reentry vehicles. "5 This official added that Iraq might also be seeking composite technology for use in its chemical, biological, and nuclear programs. This concern was confirmed by Khadum, who told a senior Matrix Churchill official, who was informing British intelligence, that TDG bought a share in the Learfan factory to obtain access to carbon fiber technology.6 Evidently frustrated by the refusal of financial assistance, Habobi decided in September 1989 that TDG should sell its interest in the factory. When the plant was sold, TDG and SRC realized a significant profit. Throughout its existence, TDG insisted it was a private civilian company supplying items for strictly non-military uses without connections to the Iraqi government. It would admit it was a subsidiary of Al Arabi, but it maintained that Al Arabi was a private trading company, also with no relation to the Iraqi government. Conclusion. Iraq's purchase of European companies significantly improved its ability to acquire sensitive technology and equipment for its nuclear and missile programs. These companies came to depend heavily on Iraq for business and became more willing to export items to Iraq that were in violation of national export laws or known to be for Iraq's armaments, ballistic missiles, or nuclear weapons program. Proliferant states often seek middlemen to facilitate the acquisition of sensitive items. In some cases, the middlemen obtain an item and transport it to the proliferant state. Other times, an agent merely puts the proliferant state in contact with a supplier who then provides the item. Although the item may be controlled, it is just as likely not to require an export license. The motivation for a middleman is usually money. A country may use a middleman to disguise the true end-user of an item. A supplier may have previously dealt with a particular middleman and may accept the middleman's explanation of the end user. The following examples of Iraqi efforts serve to illustrate a range of activities of middlemen. Obtaining Maraging Steel. Although Iraq is not known to have extensively used middlemen, it did use one to obtain maraging steel, a critical material for its gas centrifuges. Maraging steel is a high-strength steel that has a wide range of civilian and military uses, including gas centrifuge rotors and end caps, missile casings, aircraft forgings, cannon, and transmission shafts. Typically, gas centrifuge programs seek grade 350 maraging steel. Maraging steel of this grade is controlled, although loopholes in the controls on maraging steel existed in Europe in the late 1980s. A Fortuitous Lead In 1988, Adel Ali Ridha, a senior member of the Iraqi gas centrifuge program, met a French dealer of the company 3F at the Saddam Establishment, near Faluja, a site involved in making military equipment and often visited by foreigners. (This site was also manufacturing gas centrifuge components in secret and was visited by Bruno Stemmler and Walter Busse.) The dealer, who was apparently ignorant of Adel's true employer, told Adel that he represented a company that manufactured 250 and 350 grade maraging steel. Adel was interested and asked for samples of both products. About one month later, the Frenchman returned to Baghdad and told Adel of difficulties in getting an export license for exporting maraging steel to Iraq. However, he volunteered to assist Iraq in finding another supplier. On his next visit, the Frenchman brought maraging steel samples, but he would not disclose the supplier. Iraq with the assistance of H+H Metalform analyzed the samples and established the specifications needed for Iraq's centrifuges. After providing the results to the Frenchman, he returned with new samples, which met the Iraqi standards. With Iraq willing to sign a contract, the Frenchmen set up a meeting in France in October 1988 with Muzhar Malik, a Pakistani middleman based in Britain. Malik provided two samples of the maraging steel he would provide under the contract. After testing the samples, Iraqis met Malik in Britain and signed a contract with Eurocom Incorporated of Saudi Arabia for the supply of 100 tonnes of grade 350 maraging steel, half of which was in the form of tubes and the rest shafts. The details of how Malik obtained the maraging steel are sketchy. What is known is that he contracted with the Austrian firm Boehler Edelstahl for 106 tonnes of maraging steel. According to a former senior Action Team member, who investigated this case, Boehler believed that Malik was acting on behalf of Pakistan. Malik is known to have earlier provided at least 57 tonnes of maraging steel to the Kahuta enrichment plant in Pakistan, he added. In any case, Boehler officials did not associate the shipment with Iraq. According to Nuclear Fuel, the first shipment of 71 tonnes of maraging steel was shipped from Antwerp in May 1989 aboard a Pakistani-owned ship.9 The shipment was unloaded in Dubai and shipped overland to Iraq. The second shipment of 29 tonnes went by the same route in June 1989. Missing 6 tonnes The fate of the other 6 tonnes of maraging steel is unknown. Iraq declared that it received only 100 tonnes. According to Boehler officials, they made an extra 6 tonnes to replace any steel that did not meet required specifications. Once the contract with Iraq was fulfilled, Malik entered into another contract with an unknown company for this excess amount, according to a senior Action Team official. This shipment went from Austria to Hamburg where it was loaded on a Finnish freighter. This freighter made a number of stops, including Dubai, Karachi, and Bombay. The maraging steel could have ended up in Iraq, India, or Pakistan, all of which have gas centrifuge programs. The letter of credit for this shipment is from a bank in the Jersey Islands. The original order from Iraq was paid by a different bank's letter of credit (BCCI). Seeking Help From China. Iraqi centrifuge officials wanted to approach China for assistance in acquiring gas centrifuge equipment. To that end, they asked assistance from Roy Ricks of the British company RWR International Limited and previously with Meed International and TEG. Ricks arranged for the Chinese to supply Iraq with about 50 aluminum-nickel-cobalt (AlNiCo) ring magnets and 25 cobalt samarium ring magnets for centrifuge upper bearings. However, the Iraqis judged these ring magnets to be poor quality. In July 1989, a Mr. Chow, a Chinese-American, arranged a visit by Ricks and a team of Iraqis to China to discuss acquiring additional gas centrifuge equipment. At the Chinese ministry responsible for materials, the Iraqi team discussed buying a plant to make the more advanced cobalt samarium magnets for centrifuges and the necessary raw materials, cobalt oxide and samarium oxide. At the Ministry of Energy, the Iraqis discussed gas centrifuges with their hosts and asked for help in getting items, including instrumentation to measure the flow of uranium hexafluoride. The Iraqis said that the Chinese appeared knowledgeable about centifuges. The Iraqis said that if China would help Iraq on centrigues, the Iraqis would buy a cobalt-samarium manufacturing plant at a cost of about 5.7 million British pounds. The Chinese said that they were ready to cooperate, but Iraq would need to include the IAEA in any deal, implying that the centrifuge equipment would need to be in a safeguarded facility. At that point the Iraqis dropped their request. After this trip, the Iraqis said that they "dropped Roy Ricks." Soon afterward, an article appeared in Middle East Markets, a newsletter published by The Financial Times of London, that reported that China was helping Iraq make specialized magnets for gas centrifuges.10 The Iraqis were convinced that Ricks was getting back at them for firing him. In the end, Iraq ordered most of its cobalt-samarium magnets for its centrifuges from Trebacher in Austria. The main order, which was shipped via Singapore to Jordon, was evidently never delivered to Iraq because of the international economic embargo imposed after Iraq invaded Kuwait. Technical experts can provide invaluable assistance to proliferant states, particularly those lacking specialized knowledge about nuclear areas. As a result, proliferant programs have invested considerable effort in recruiting experts. Recruiting experts can be difficult and sometimes success depends on more on luck than plans. In any case, knowledge of foreign industries and experts can be the starting point for a recruitment effort. In addition, trusted agents have been approached to find other experts. Iraq was fortunate to have recruited three extraordinarily knowledgeable experts to help its gas centrifuge uranium enrichment program in the period 1988-1990. Walter Busse, Bruno Stemmler, and Karl Heinz Schaab had worked for years at MAN New Technology in Munich Germany, an important subcontractor to the German Urenco partner. Iraq recruited these experts through H&H Metalform. How much and exactly what type of assistance these three individuals provided Iraq has been intensively studied for over a decade. It will probably never be possible to develop an entirely consistent and complete picture of what they provided to Iraq. But it is clear that these experts provided a considerable amount of sensitive information about Urenco gas centrifuges. The assistance was broad in scope, occurred regularly in the period 1988- 1990, and included many advanced Urenco technologies. The level of assistance provided by these three experts was key to progress in the Iraqi gas centrifuge program. These three experts provided the Iraqi gas centrifuge program with classified design drawings of centrifuges developed in the late 1960s and early 1970s and a newer, advanced design from the mid-1980s. These experts also provided documents describing many sensitive subjects, including testing and manufacturing methods, detailed specifications of centrifuge components, cascade operation, and information about the bottom bearing and magnets used in the upper bearing. They also identified and showed the Iraqis how to overcome problems in testing, building, and operating centrifuges, including "tricks of the trade" that can be critical to the success of a new program. They identified key suppliers of equipment, components, and materials. They also assisted in obtaining items from European companies. The recruited experts provided some centrifuge components to Iraq. They made some of these components themselves. Other components are believed to have been taken from MAN and include centrifuge motors and the highly classified bellows that would enable Iraq to produce super-critical, high efficiency centrifuges. A consequence of this assistance was that Iraq dramatically accelerated its gas centrifuge program in the late 1980s. Within a few years of starting, Iraq was approaching the stage of being able to manufacture subcritical gas centrifuges based on Urenco designs and assemble them into a small cascade. For more information on these three experts, click here. 1 See, for example, Sir Richard Scot, Report of the Inquiry into the Export of Defense Equipment and Dual-Use Goods to Iraq and Related Prosecutions, House of Commons, February 15, 1996. 2 Sir Richard Scot, Report of the Inquiry into the Export of Defense Equipment and Dual-Use Goods to Iraq and Related Prosecutions, D2.266, p. 301. 3 See for example, "Turning Matrix into a World Force," Machinery and Production Engineering, October 20, 1989. 4 For a more detailed description of this attempted purchase, see William Lowther Arms and the Man, Dr. Bull, Iraq and the Supergun (Novato, CA: Presidio Press, 1991). 5 Sir Richard Scot, Report of the Inquiry into the Export of Defense Equipment and Dual-Use Goods to Iraq and Related Prosecutions, House of Commons, February 15, 1996, D5.25 xvi, pp. 529-530. 6 Scot report, op. cit., D5.25 xvi, p. 530. 7 Scot report, op. cit., D5.25, xvii, p. 530. 8 Mark Hibbs, "Centrifuge-Grade Maraging Steel Shipped From Germany is Missing," Nuclear Fuel, October 24, 1994. 10 See for example, James M. Dorsey, "Iraq Gets Chinese Aid on A-Bomb," Washington Times, December 14, 1989, p. A1.